We've made it all through the house for spring cleaning, YAY! It's a lot of work but it feels really great to have it done. Need some tips to help you start or to keep you going? I thought I'd share a few of my favorites. - Declutter as you go. Clutter is most of the mess in the first place. Through out the year, notice what is cluttering your space and fix it. Go through what ever the mess is, throw out the garbage, and put everything else back in its right spot. - Start with your most dreaded project first. Turn on some music, hand the kids a duster or a squirt bottle (of water) and a rag and let them help out. Then the rest won't seem so bad. - Eliminate odors in the kitchen by cutting a lemon or lime in half and running it through the garbage disposal. It freshens up the smell of your kitchen every time you turn it on, until the lemon is gone. - Use a seam ripper to cut and remove the hair, thread and other stuff tangled around the beater bar of your vacuum. - Once you start cleaning, don't stop. If you're in the cleaning groove, keep it up. It's much harder to start again when you do start again. - Have your kids help. It's better for them to learn the cleaning stuff sooner rather than later. If you get them into the habit of cleaning their things up, your house will stay cleaner so much easier. I have Jay help make her bed, put her clothes away, dust, and sometimes she helps wipe down surfaces in the bathroom with a lysol wipe. Are you ready to start? 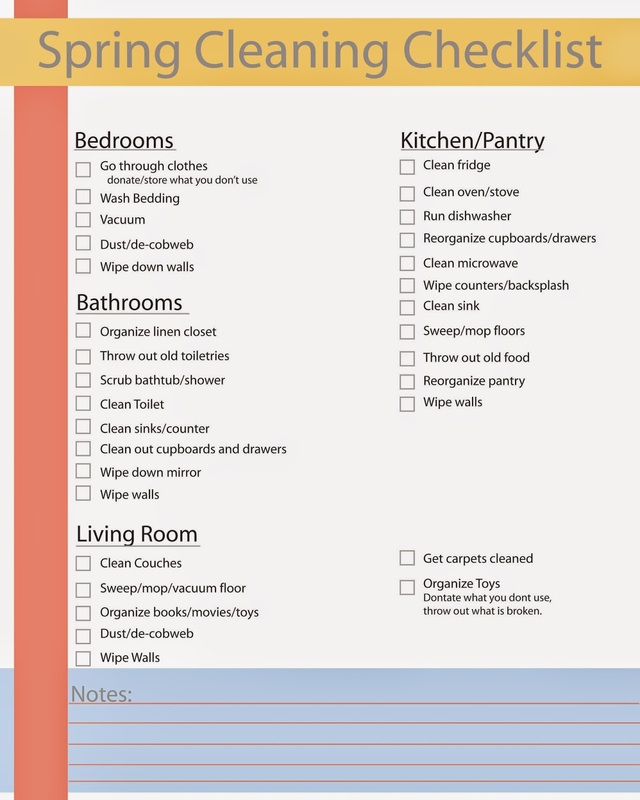 Here is a checklist for you to print out and keep track of all of the things you need to spring clean. What are your favorite quick cleaning tips? I love how you said that once you get in your cleaning groove--don't stop! Thanks! Yeah I notice that if I can get myself going on it, it's so much harder to start again if I stop. Much better just to keep going.